Don’t you love these stripes? Like wrinkled stockings, it’s irresistible to think that the legs need pulling up. Each zebra has it’s own unique pattern and it’s interesting to spot the individuals from their distinctive markings. The purpose of these stripes has led to various theories – one is that is it may help regulate temperature. Another is camouflage, and from experience these animals have a way of blending into the landscape. The dazzle of the stripes may also make it more difficult for predators to target a single animal when grouped together in a herd. 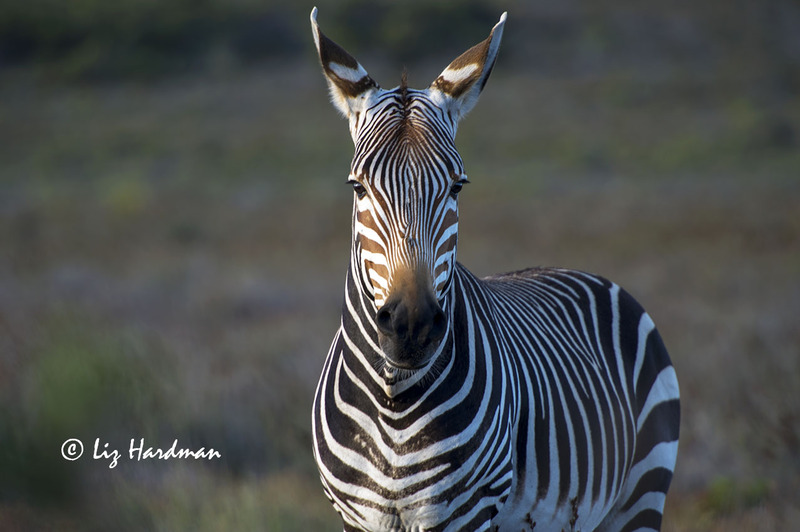 Some years ago, there was a happy event with the birth of a zebra foal (born 19 July 2011) here at the Cape of Good Hope Reserve. Above is a shot of Pa and the male foal; mother and another female complete the small herd. You’ll note their distinctive face patterns and how they differ especially the stripes below their eyes. Perhaps the female, above (December 2012) is the mother of the foal. The lines below her eyes are cleanly and evenly spaced. I’ve kept track of the family observing them over the last few years and through photographs can identify the individuals. Early in winter this year the group split and recently I photographed the alpha stallion with only one female and the assume that the young male is with the other. The stallion above, photographed on 5 September this year and the female below. See how their face patterns match up with the early 2012 shots? The Cape mountain zebra (Equus zebra zebra) is a subspecies of mountain zebra that occurs in certain mountainous regions of the Western and Eastern Cape provinces of South Africa. It is the smallest of all existing zebra species and also the most geographically restricted. Although once nearly driven to extinction, the population has now been increased by several conservation methods, and is classified as Vulnerable by the IUCN.